Since there are so many onsens to be found in Japan, you would be correct in assuming cleanliness is extremely important for Japanese people. But the big difference between Japanese and Western bathing is that Japanese people wash and shower before entering the onsen. This is because the water is usually shared. You can experience all the beauty and seduction of Japan and bathe in outdoor mineral springs when you visit The Japanese Mountain Retreat in Melbourne. This luxurious resort offers couples the chance to try this ancient tradition of Japanese bathing. You don’t have to worry about sharing your onsen with strangers, as your secluded bathing experience is completely private for the two of you. In keeping with typical Japanese onsens, the Japanese Mountain Retreat enjoys a scenic location on a five acre property and is beautifully landscaped like many of the onsens in Japan. Where Can You Find Hot Springs in Japan? Everywhere, from Hokkaido in the north to Okinawa in the south. Japan is one of the most abundant places in the world for natural hot spring water. It has more than 3,000 mineral-rich thermal hot springs (the word onsen literally means hot spring). The reason for this concentration of hot springs is because Japan is a mountainous country and has many volcanoes. Most hot springs in Japan are clustered in volcanic belts in the Kyushu, Tohoku and Chubu regions. The volcanic groundwater is pumped to the onsen and is filtered and heated to the right temperature for bathing. In a similar way, the Japanese Mountain Retreat sources mineral water from deep in the Dandenong Ranges, and pumps it from an underground spring to its indoor and outdoor pools from approximately 80 metres below the ground. The mineral water is heated to 37-40 degrees, just right for private luxury outdoor bathing. Traditionally Japanese onsens were used for medicinal purposes and were believed to cure a great range of ailments. From helping the flow of chi energy and rheumatism, to dermatosis and neuralgia, the healing powers of Japanese hot springs are legendary. The greater the amount of minerals, the more effective the water, and different onsens have different types of medicinal benefits. 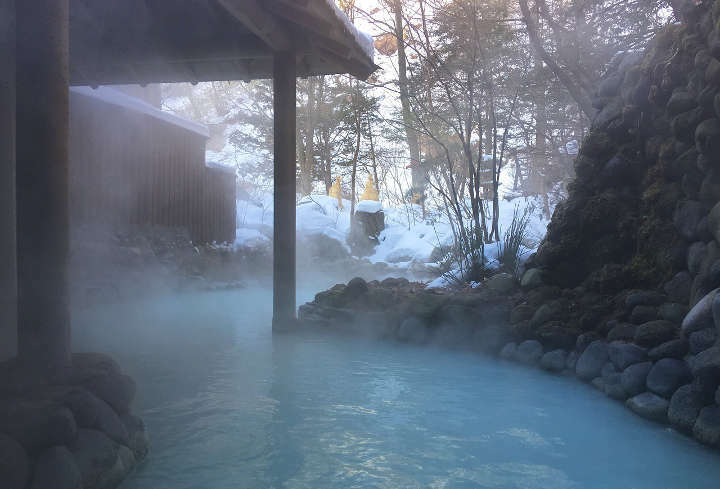 For example, an onsen with carbonic acid, hydrogen sulfide or radium is meant to be good for high blood pressure and improving circulation, while an onsen with a high sulphur content is believed to be beneficial for arthritis and rheumatism. Onsens with high concentrations of sodium bicarbonate help eczema, while ones with iron can help those suffering from anemia or menopausal issues. Salt onsens can improve muscle and joint pains and in some cases even boost fertility. At Japanese Mountain Retreat in Melbourne you can indulge in the the ancient tradition of mineral bathing on a couples escape or choose from luxurious day spa treatments which incorporate relaxing hot spring bathing and the healing power of massage. Do People Still Use Onsens For Medicinal Reasons? Yes, and no. The older Japanese generation might decide to visit an onsen resort for medicinal or health benefits, but the younger generation visit onsens more for relaxation and refreshment. Certain times of the year can also prompt a visit to an onsen, for example, many people celebrate the winter solstice by bathing in an onsen fragranced with yuzu fruit to strengthen the immune system. No matter whether your focus is on health or relaxation, or celebrating a special occasion you should choose an onsen that has the right ambience and atmosphere for you. An intimate resort like the 5 star Japanese Mountain Retreat in Melbourne is a truly memorable way to experience an onsen with a loved one. The ancient tradition of Japanese hot springs has inspired Japanese Mountain Retreat to create 1 night accommodation packages or 2 night accommodation packages to rest and relax the body. Accommodation packages combine beautifully designed villas with traditional futons, hot springs bathing, day spa treatments, dining and breakfast. Designed for just 3 couples at a time this exclusive resort is one of the ultimate romantic getaways in Melbourne. Contact us or head to Japanese Mountain Retreat to book your accommodation & spa package today.